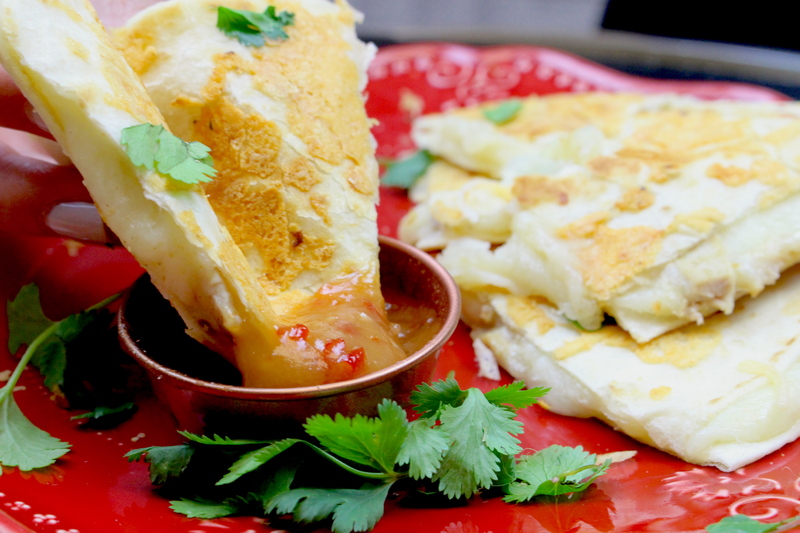 The blend of sweet and spicy in the dipping sauce is a perfect compliment to the cheesy goodness of the quesadillas. In a saucepan, combine chili sauce, rice vinegar, brown sugar, garlic, peanut butter, lime juice, ponzu, and coconut milk, whisk together over medium heat until the mixture comes to a boil. After one minute of boiling reduce to low heat and let simmer for 2-3 minutes. Then set aside and let cool. Season the chicken with cumin, salt, and pepper. Then heat a large skillet over medium-high heat and add 1/2 Tbsp of olive oil. Add the chicken to the skillet and cook until browned on all sides and set aside. Using the same greased skillet, or a different one, lay one tortilla down. Add your preferred amount of mozzarella cheese and chicken on the tortillas. Top with a second tortilla. Lightly butter second tortilla and lift to place desired amount of parmesan cheese on skillet and flip butter side down, repeat process on each side. Cook until the tortilla is crisp and golden and the cheese is fully melted. Serve with dipping sauce, garnish with cilantro, and enjoy!